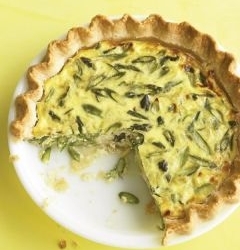 Quiche Shell is an easy pie crust recipe for making one crust. Mix carefully with fingers. Refrigerate dough at least 1 hour or overnight if possible. Roll out pie dough to ⅛ inch thickness. Working gently, line the bottom of the pan, overlapping the top slightly. Set a pie weight in the center and press around the edge to cut off excess dough. Remove the weight and let cool. Pour quiche mixture into the pastry and continue baking until done.